Not to worry. Google's been nice enough to whitelist us for a little while, so even though most of Google Code will be down, we'll continue to be up. This is not permanent, but for the time-being, you'll still be able to report bugs at the old address. Going forward, we'll be migrating off of Google Code and onto a new tracker. That will happen in the coming weeks, and we'll talk more about it when it happens. So why the delay? Why did Google need to extend the shutdown date for us? We actually have something new on the way that we're pretty excited about. We call it Splat, and while still very young, it's shaping up to a pretty cool bug/issue tracker. We weren't quite prepared to switch over to it by the shutdown date, but we have enough of it ready to launch pretty soon. There's a lot more that I'd like to say about Splat, but there will be time for that. We'll make a more formal announcement soon. 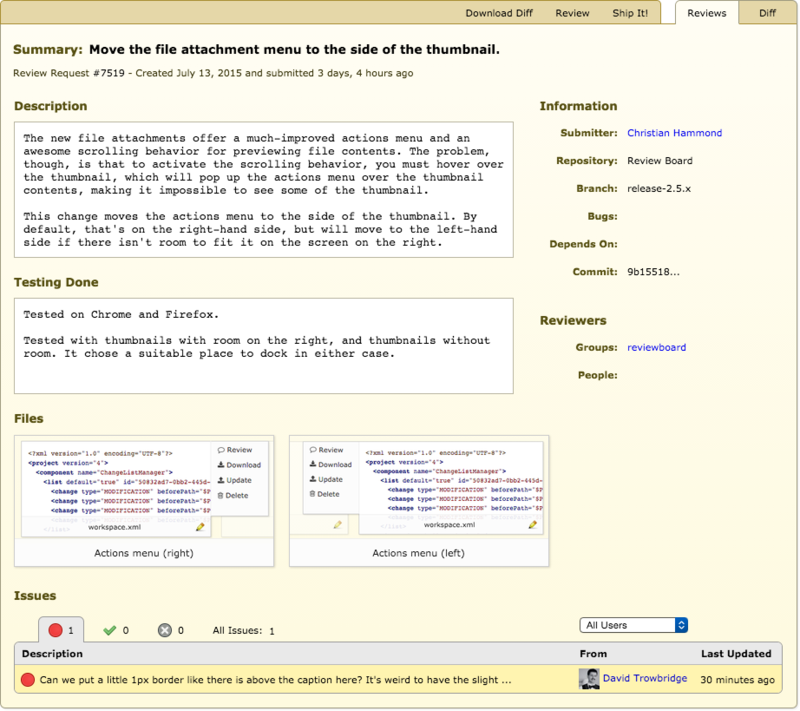 Review Board 2.5 RC 1 is out! We're in the home stretch for the big release of Review Board 2.5. Today's release candidate is, we hope, the last release before 2.5 goes live, so if you've been waiting for a good opportunity to jump in and test it out, now's the time! 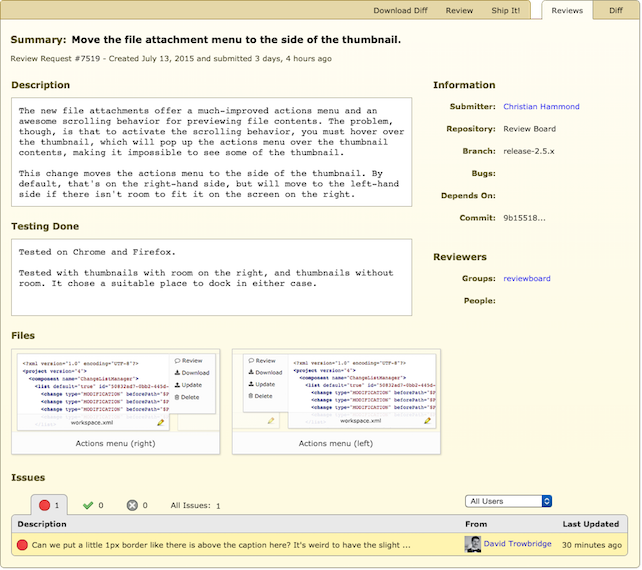 This release primarily focuses on bug fixes, with a few new extension and Markdown improvements that came along for the ride. Some of the extension features (namely, new hooks that control some e-mail behavior) and fixes are ported over from the upcoming 2.0.19 release, so those of you staying on 2.0.x will be getting those soon. The login, registration, and password reset pages are now mobile-friendly, helping you to get going quickly on your mobile devices. Once you're in, you'll find some improvements to the dashboard and user pages to help you filter for the review requests you want to find. Once again, barring any major problems, we will be releasing the final 2.5 soon. That means if you're planning an upgrade soon, you should really give RC 1 a test to make sure the final 2.5 will work for you. If you want to give this release a try, please do so on a test server with a copy of your production database. Please give it a try and report any bugs that you find! Review Board 2.5 beta 2 is out! Hey there, everyone! We have a great release this week for those of you living on the bleeding edge and helping us beta test the next generation of Review Board. Review Board 2.5 beta 2 is out, bringing new API enhancements, UI polish, better dashboard management, the beginnings of mobile support, and more. This builds on top of all the features we announced for beta 1 back in March. What you'll notice right away are the changes to the UI. We've been going through the product and working to polish things up, and have been making good progress. You'll see some tweaks to the review request page, file attachment thumbnails, the diff viewer, dashboard, and the New Review Request page. So let's take a quick look at some of the highlights of the beta. We've also made the dashboard usable on a mobile device. 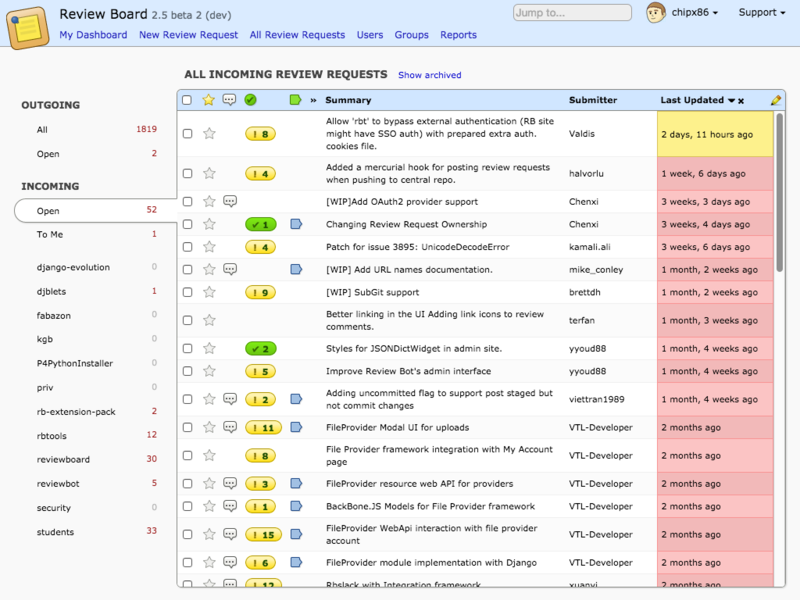 In fact, most of Review Board is now usable, with the rest to follow. Try resizing your screen on our demo server to see how it works. The review request page has some general tweaks all over. We've added tab-based navigation, increased the amount of room for the content, and more. The file attachment thumbnails are now wider, and show more of the thumbnail than before. Hover your mouse over the thumbnail, and it'll scroll to show you even more of the page. If you're on a high-DPI ("Retina" display), your thumbnails will be even more crisp and clear. You'll also notice that we've completely redone the issue summary table, giving it a visual refresh and make it a lot easier to both see what's open and to filter it. At a glance, you can now see exactly what's left on your plate without reading a bunch of text. To filter by a status, simple click the status. This is far better than the old text-based stats and drop-down lists we had before, don't you think? That really just scratches the surface. We didn't even show off the mobile UI, the New Review Request page, or the new format for reviews. That will come in time. Check out the release notes for everything in this beta. You can also follow our work over at the Review Board ChangeLog, our new community forum for all things Review Board development. Last week's release of Power Pack 1.3.1 hit some snags with Review Board installs running on Python 2.6. We've fixed these issues, and things should work smoothly once again. Other than this fix, this release is the same as 1.3.1, meaning that if you're running on Python 2.7, you won't need to upgrade.